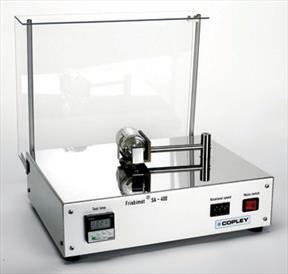 In many cases, such as with hard coated and uncoated tablets, granules and spheroids, it is impossible to determine the friability of the dosage form using a conventional tablet friability tester even if the test time is extended simply because the resistance is such that no measurable attrition is obtained – the energy imparted by the friability tester is just not sufficient to generate quantifiable changes in surface mass. The Friabimat SA-400 is a new instrument specifically designed to address this particular problem by offering an alternative method of friability measurement. For the purpose of the test, the sample is confined within a standard 105 mL glass bottle horizontally mounted on the end of an oscillating arm. The abrasive action is generated by the horizontal shaking movement of the oscillating arm which causes the samples to rub against and collide with each other and/or the internal surfaces of the sample container. The intensity of the abrasive action and the duration of the test can be adjusted via the controls mounted on the front panel between 0 and 400 oscillations per minute and 0 and 9999 seconds respectively.